Hiring a roofing contractor to work on your home’s roof is actually a very important decision you’ll make when it comes to your home. Because the roof on your home protects it from storms, weather, and water, the roof needs to be installed correctly and if you’re getting roof repair in Brighton Michigan you’ll need to make sure it’s done the right way or else you will probably run into some major problems down the road. 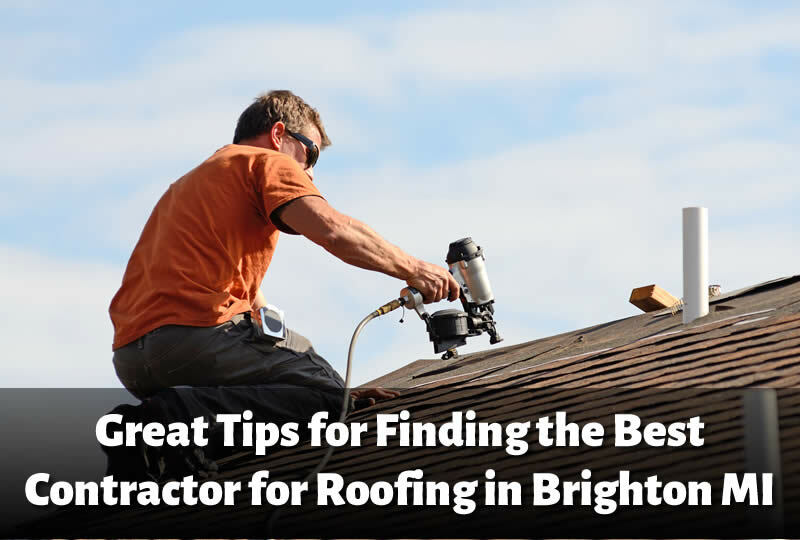 In this article I’ll go over some of the tips for finding the best contractor for roofing in Brighton Mi to help you get help with your roof. Here at Livingston Roof Pros we live up to each and every one of the tips given so we hope you’ll choose us for your roofing needs in Brighton Michigan. Trusting your home’s roof to an unqualified contractor in Brighton Michigan means you could be risking your home to damage caused by problems with the roof. When a water leak in the roof develops it can cause all sorts of problems for the interior of the home. From damaged walls and ceilings to other problems including damages to furniture and electronics in the home. Make sure you use a quality contractor for roofing in Brighton Michigan to ensure your roof repair in Brighton Michigan is done correctly the first time. I’ll go over below some of the reasons why we think you should choose Livingston Roof Pros for your roofing contractor or what you should look for in your roofing contractor in Brighton Michigan. When using a roofing contractor in your home be sure they are properly qualified. Many manufacturers offer certification programs and certificate programs. At Livingston Roof Pros we have certified roofing experts that have qualifications with all the major roofing manufacturers. Whether it’s asphalt shingle roofing, metal roofing, or any other type of roofing we support here at Livingston Roof Pros you can be sure you’re using a fully qualified roofing contractor to install or repair your roof. For most homes, you’ll need a permit in order to do any sort of construction work on your property. At Livingston Roof Pros we secure all the necessary paperwork to ensure the project is completely legit and you won’t run into problems later. Don’t trust a contractor who says you may be able to ‘get away with it’. Having all the necessary permits and inspections is a must especially if you ever decide to sell your home later. Does Your Roof Contractor in Brighton Michigan offer a Warranty? At Livingston Roof Pros we want to make the customer completely satisfied with the work and service that we provide. That’s why we guarantee all the work done and make sure it’s done correctly the first time. If you’re not completely satisfied with the service you get from Livingston Roof Pros please let us know and we’ll do everything we can to make sure you’re completely satisfied. You may also have warranties on the roofing products that are installed by Livingston Roof Pros. Talk with the roofing technician during the estimate to learn more about warranty options for your new roof installation. Does the Roof Contractor Work on Your Schedule? Finding a roofing contractor that can work around your schedule can be extra helpful. Usually the time to replace a roof is a few days and during that time things can get a little hectic around your home. If there are days when you’re not home or the home has less traffic finding a roof contractor that can work around that time can be really helpful. Alternatively, you don’t want a contractor that does roofing in Brighton Michigan to start and stop on the job as well. Having a contractor that you can count on to complete the project in a timely manner without breaks in between for various reasons is best. This way your home is covered in case of storms or rain. Having a roof contractor that removes your roof and then takes days to install a new roof is not good. If you need roofing in Brighton MI be sure to call Livingston Roof Pros today to learn more about the services we offer and to get a free roof estimate. What Are The Benefits of Making Timely Roof Repairs in Howell Michigan? Livingston Roof Pros services the entire county of Livingston Michigan. We are a residential roofing company that offers roof repair, new roof installations, and more. Our main office is in Howell Michigan. We offer competitive pricing on roofing services and we are focused on customer service. Read more about us here.